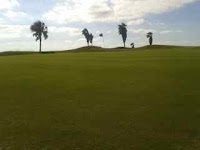 While Bob had a great time playing golf in Corpus Christi at the Oso Municipal Golf Course with Fred Porter on Sunday, his friend from Plano (Fred O) and another resident at the Gulf Waters RV Resort, Connie spent the day shopping with Fred's wife Vickie, and Fred O's girlfriend in Port Aransas, TX. After coming home to Portland, we had the wild hair to take 'the girls' back out to Port A and visit longer into the night (till around 11p!) Great times with good friends. Monday, back to the grind, a little bit of a overcast day thinking of spitting rain. 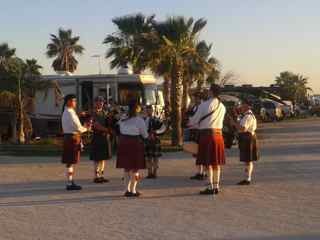 SeaBreeze RV Resort hosted a Bagpipe Band as a part of their pre-Potluck Dinner, Thursday night. 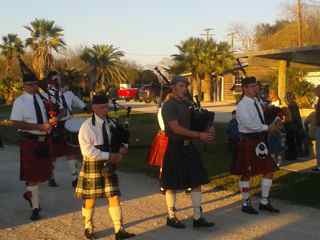 Nice to see the kilts and Scots tradition. Had a great time Friday hosting our friends, Fred and Vickie Porter, for a dinner and evening of cards. Saturday, with friends and family coming to visit during most of February, we bid adieu to the NorthShore Country Club where we had our Winter Texan membership. We'll miss our (almost) daily tee time, but looking forward to re upping our membership come March. Had some thunderstorms roll through this morning. Great contrast from the blue water of Neuces Bay to the dark clouds that rolled in from the west. Texas really needs rain and this morning was barely a drop in the bucket. Another day of golf at the Northshore Country Club. Wind is such a challenge when it affects your shots so much. Adds another element to the course. Hope everyone had a great holiday season. Hard to believe it has been that long since our last post. We will try and catch you up on what we have been doing. Since landing in Portland, TX, we have been learning our way around and getting to know the neighbors. Made some great friends that we have been hanging out with on occasion. Unfortunately, they did not have a long-term reservation and had to move to another park. Good news is that their new place is near the beach and within an easy drive. We can now say that we survived the first Christmas alone. It wasn't easy, but thanks to technology (video phones), we made the best of it. The new year came and went with no big fanfare here. Pretty much business as usual for us. 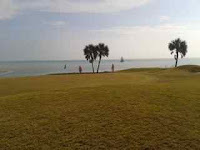 Bob celebrated a birthday on January 8th with a trip to Galveston. We were supposed to have a luncheon and tour on Royal Caribbean's Mariner of the Seas, but due to fog in the harbor, that was cancelled. However, he was surprised by a visit from our daughter from Ohio. We had been secretly planning the visit for some time. Sure was fun to spend a few days with her! Now, why have we been so busy? Well, for one of our Christmas gifts, we received a monthly golf membership to the local Country Club - Northshore Country Club. We have been making the most of the membership and playing nearly every day. Feels great to be back on the course again. That, coupled with running our travel business, has kept us hopping. Things are starting to get back to normal and we are feeling very settled in. Hopefully, we will be able to post more regularly again.